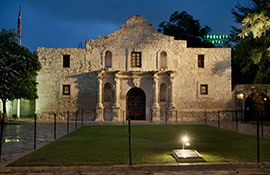 This 138-room hotel sits on land that was once part of the Alamo compound, the site of Davy Crockett's last stand. Now on the National Register of Historic Places and a member of Historic Hotels of America, the hotel's history is displayed in photographs in the large atrium lobby. The outdoor pool is a welcome respite on a hot day. Guest rooms are larger than most San Antonio area hotels, with plantation shutters adding Texas character. Stop by for a San Antonio Scrub & Rub at the Alamo Plaza Spa—a full service spa with a steam room and sauna next door at the hotel's sister property the Menger Hotel. The Crockett Hotel welcomes pet guests with treat and water in the lobby, and a very smart Crocket souvenir bandana. Complimentary continental breakfast buffet includes scrambled eggs, plenty of fresh fruit and the hotel's famous Texas-shaped waffles. Ernie's bar is a popular spot for Happy Hour, offered 7 days a week, with free popcorn and famously friendly bartenders. Planning a meeting or event? The Alamo Room provides space for up to 70 guests, and the Seventh Floor is like a private penthouse suite, ideal for company retreats and wedding parties. You're 18 steps from the Alamo, and across the street from River Center Mall and the Riverwalk: this is a prime downtown San Antonio location. Cancel by 3 pm, 48 hours prior to arrival.